Graffunder and Tremaine round out podium; Geiger takes first women's main event win. Cody Webb took his fifth straight EnduroCross main event win on his FMF KTM in Boise. Photo: Tanner Yeager. BOISE, ID. 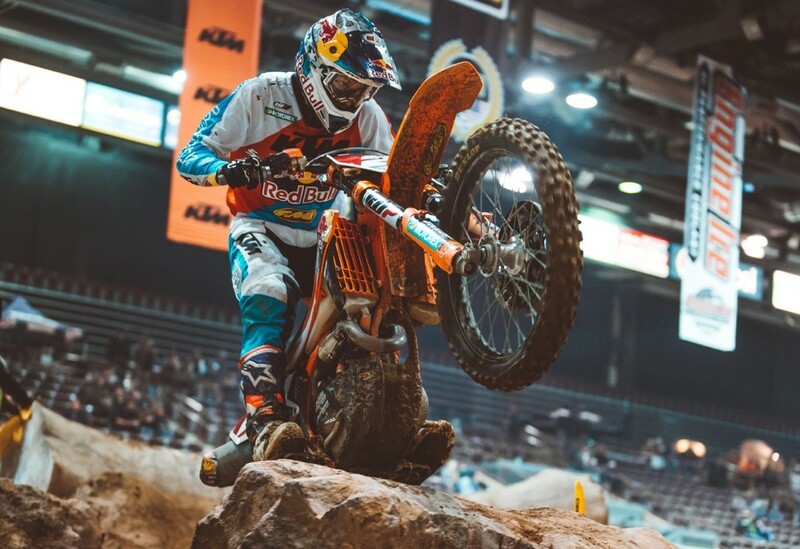 (November 4, 2017) – Cody Webb dominated the Boise EnduroCross to take his fifth straight win. The FMF KTM Factory Racing rider had a nearly flawless event, setting the fastest hot lap time, winning the qualifier and taking the main event. SRT Offroad backed Cory Graffunder was Webb’s closest rival on the night and won the bracket race and finished second in the main. Ty Tremaine finished third for the second consecutive race despite a bad start. Webb got the night started off strong with a win in the Super EnduroCross gate pick qualifier. Graffunder served notice that he was ready for a good result by finishing second and Cooper Abbott put in a strong result for third. In addition to determining the main event gate picks, this race sets the matchups for the bracket races. The top 12 riders face off in the single lap brackets races and this, again, provided a lot of excitement. Webb and Graffunder each won two rounds to face off in the final. Graffunder managed to beat Webb to the first turn and put in a flawless lap to take the win, despite heavy pressure all the way to the finish, and earn a bonus point in the championship. Cory Graffunder put in a great ride in Boise to finish second. Photo: Tanner Yeager. Ty Tremaine recovered from a terrible start to finish third. Photo: Tanner Yeager. Beta’s Max Gerston had a pretty quiet night but came out with a fifth-place finish on the tough Boise track. Aaron recovered for the sixth position. Abbott finished seventh and fellow Yamaha rider Mason Ottersberg finished eighth. Redmond finished in ninth after a pretty tough night that included a big crash in the qualifying race. Ty Cullins rounded out the top ten on his Beta. Joan Pau Segura, Eric Rhoten, Noah Kepple, Wally Palmer and Quinn Wentzel finished 11th to 15th respectively. Webb (center), Graffunder (right) and Tremaine took the Boise Podium. Photo: Tanner Yeager. Tarah Gieger took her first ever Women’s EnduroCross main event win coming out on top of a great three-way battle with Shelby Turner and Kacy Martinez. It was a popular win for the former Women’s Motocross champion that has been trying to get an EnduroCross win for years. Tarah Gieger (center), Shelby Turner (right) and Kacy Martinez (left) shared the women's podium in Idaho. Photo: Tanner Yeager. Destry Abbott kept his undefeated streak alive in the Vet class on his Purvines DA8 Yamaha. Canada’s Stephen Foord put up a good fight and ultimately finished second. David Stirm took another podium on his Husqvarna. David Kamo, a former top desert racer, and Idaho resident took the Open Amateur main event win. Canada’s Kevin Dupuis put up a great fight and crashed in the final turn attempting to make a pass for the lead but held on for second. Shelby Turner, the 2016 Women’s EnduroCross champion, took the final podium spot, the first ever woman to earn a podium in the Amateur class. In the Amateur B class, James Flynn took the win on his Husqvarna. Justin Rokosh finished second on a Yamaha and Austin Serpa rounded out the podium on his KTM. Stephen Foord took the TrialsCross main event win. Anthony Johnson and Kaden Jenkins took second and third respectively. The final round of the 2017 EnduroCross series will take place at the Citizens Business Bank Arena and Saturday, November 18th.